This restaurant cooking method is the fastest, easiest, most reliable method for cooking a variety of protein, including: chicken, steak, rack of lamb and fish. Your weeknight meals have just been upgraded! There are so many ways rice is cooked around the world. Check out these delicious international rice dishes and methods of cooking. There is hardly a dish that doesn't get a little brighter and happier with a few pomegranates strewn on top. Here are 11 great recipes to celebrate pomegranate season. 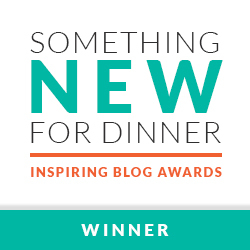 This year Something New For Dinner sponsored a scholarship that was awarded for the best essay on "How we should encourage smarter eating." Here is our winner and his well-thought out essay. What happens when your two favorite super foods have a baby? Kalettes are a non-GMO cross breed of kale and brussels sprouts. Learn more about this delicious new garden treat. Passion fruit provides unique flavor to desserts, salads & cocktails. Find out where to buy them, how to grow them and their nutritional & health benefits. Orange blossom water is used in Mediterranean cuisines including French, Moroccan and Lebanese for both sweet and savory dishes. Orange blossom water is used to add interest to a variety of cocktails. Learn how to use and where to buy this aromatic ingredient.